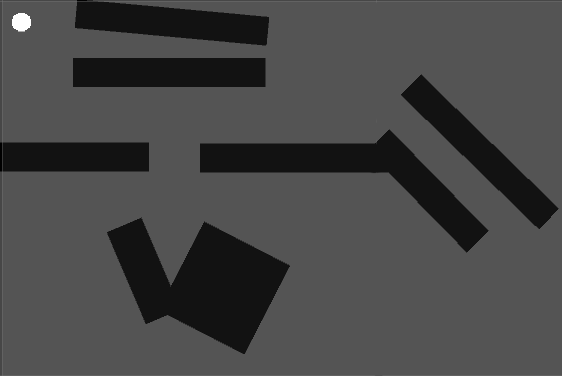 In a typical 2D grid based game, you restrict your level to fit into predefined squares. This makes it pretty easy to process this data with an A* pathfinding algorithm. But what happens if you are not creating tile-based levels? The black squares are walls. The white circle is our movable character. 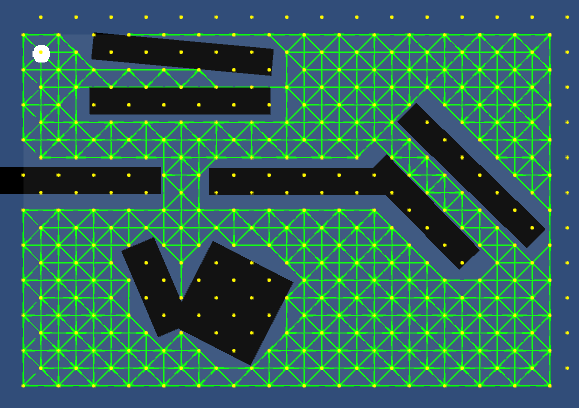 Our goal is to provide a mechanism that will allow us to calculate A* paths in a Unity level such as this. The first step, is to define an area that we will use to generate and calculate the nodal map. In this demo we do this by creating a GameObject (Grid gameobject), and setting its position and scale. This will be the area we will use to generate our Nodes. I opted to generate the nodes in a diamond shaped pattern, as it provides a much better nodal mesh than a square pattern. The distance between each node also matter. 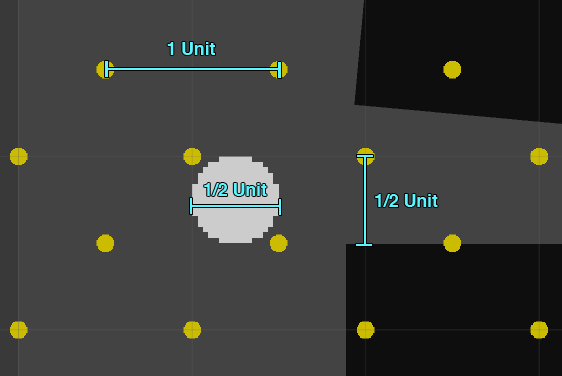 You need to match up your character’s size with the distance between nodes, otherwise you will not know if your character will be able to fit in between some holes. As long as your character is smaller than a half-unit, it will be able to fit. You could always generate multiple maps, if you have characters that vary greatly in size. The next step is to generate the Connections between each node. For each Node, we raycast in all 8 directions, to determine if the path if valid or not. If the raycast hits a wall, or if the raycast is traveling outside of the defined area, then we mark the connection as bad (red). If the check passes, we mark the connection as valid (green). Each Node will then have 8 connections. You can immediately notice that some of the paths are bad, as the circle cannot navigate between the two top-most walls for example. Also, there are some paths that lead to dead-ends, which we don’t want. We need to cull these bad paths, in order for our pathfinder to work properly. 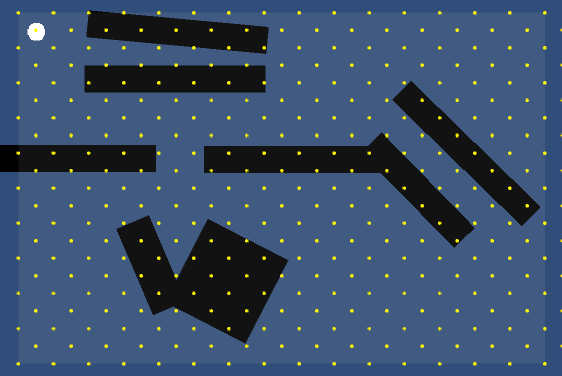 Then it is just a matter of plugging in each connection as a neighbor in your A* pathfinding algorithm. Your A* neighbors are all defined by your Nodes and their Connections. Feel free to try the Demo. Download the Unity 5 source code and project files here. Does this work to make an enemy follow the player? Yes, however, the logic that will move your enemies is not provided. This source code will provide you with a path (step by step position of each node you can traverse to get to a location). It is up to you to write the implementation of your character’s movements. I’m trying to decrease the size of the diamonds but struggling. I’ve managed to decrease the size of the diagonal ones but its the next ones which are still 1 unit away. How would I go about shortening these? Here im trying some stuff i also made a diamond shaped area, you can see the code i used there. 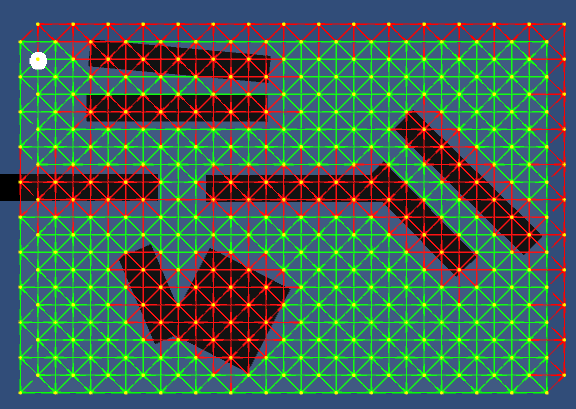 – The “Nodemesh” resolution is based on the player size, so if i change my Focus to a Player 2 that has diferent size and colider, it shall be needed to redraw the entire Grid/Nodes. How can we trigger that in run time? – Same thong Dinamic Objects qith Coliders on the Scene… if they move, the Mesh shall be re-calculated…. Witch is the best way to trigger that in run time? The unfortunate issue with this approach is exactly that — you would require a different nodemesh for each entity size that you have. Essentially, you would pre-generate a nodal-mesh for each size, and associate that nodal mesh to each entity that shares that size. For dynamic objects, you would have to update the nodes that are active based on the location of your objects. You could re-scan the entire nodal map, but that wouldn’t be very efficient. One option would be to first lock the nodes that are contained inside static objects. This will eliminate a lot of nodes. Storing your nodes in some sort of spatial organization structure, such as a Quadtree, could also benefit you. When moving your dynamic objects, you could query your Quadtree for the nodes it is touching, instead of having to loop through every single node in your map. Ultimately when it comes down to optimizing, it will be pretty dependent on your game and how you are moving your objects, and what those objects are. JGallant, I can’t find this project on your GitHub. I like the idea, but I had to fix a couple of issues when plugging it into my game. I’d like to contribute. Please let me know if you have any place I can add my changes to. I never published this one to github. I will soon so you can update the project. That would be appreciated. I wanted to ask if you ended up publishing something on GitHub. This approach seems really good. I have a doubt, how can i choose the initial nodel? If they are too large, the path cannot be the shortest, or not? Thanks, you save my day. really good, I like it. thanks for your demo, I learned very much from your code. Hey Jon, just wondering if there is any license attributed to this work? Perfect, will be using a modified version of this system for a 2D game tutorial.. Appreciate the work you have done!